Benefits of Tadasana - Mountain Pose! Benefits of Mountain Pose - Tadasana - Allow time to stand still! You don't have to be able to do put your foot behind your head to gain the mental and physical benefits of Yoga. 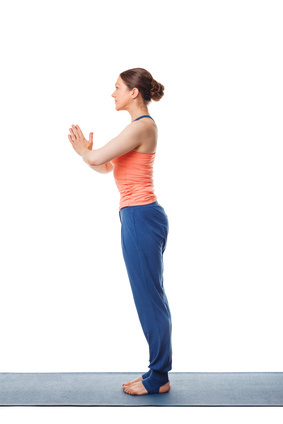 Stand with your feet about an inch apart and make contact with the floor. With your toes pointed forward distribute your weight evenly across the soles of your feet. You should be able to lift your toes off the floor. This shows you are distributing your weight correctly and not gripping the floor with your toes. Spread your toes and push down into the floor evenly with both feet to ground yourself. Extend upwards through your spine to the crown of your head, roll your shoulder blades down your back to open through the chest, pull your stomach in and tuck the tailbone under by engaging your thighs towards each other gently. Allow your knee caps to lift but do not lock your knees. Check your chin is parallel to the floor by dipping it slightly and drawing the back of the head slightly backwards. With each breath, extend upwards through the crown of your head and lengthen downwards into your feet simultaneously. Rest your hands down by your side, with fingers touching gently alongside each other, and extending down the outside of your thighs. Feel the centre of the pose from feet to crown. Stay connected to your breath as it flows up and down the length of the posture. Feeling a connection to your feet as you breath in and a connection to the crown as you breath out. Be aware of the outer parts of your body on the in breath and your core stability on each out breath. You can practice this pose in a relaxed way, where you just feel the stillness of being in the moment and do not actively energise the pose. You can stand with your big toes touching, heels of the feet a whisper apart. Bringing your hands to your heart in prayer Mudra, connecting mentally through the palms as the wrists drop to elbow level, brings further balance between the left and right sides of the body. Sitting on a chair and feeling your back against the back of the chair, while your feet rest firmly on the floor or supported on a block. This pose promotes stillness in both the mind and the body, you learn to just ‘be’. It is a very upright pose that brings a feeling of strength and confidence. it is also very opening, which frees you from fear. 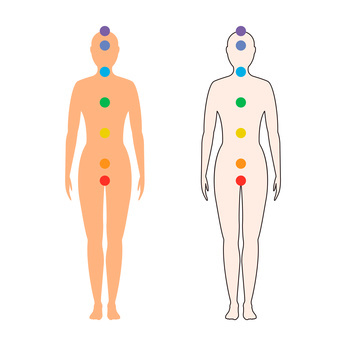 It is a very grounding posture because of the connection to the earth through the soles of the feet. It also connects you to the sky because you are extending upward and standing as tall as you can be. Balance is also an important factor in this posture. As you practice it you are balancing your energy from left to right, from front to back, from earth to sky and the mind and body become united. Through the awareness of all of these things you are freed from fear and your consciousness is raised. You also feel uplifted. This pose teaches awareness of the breath, of the body and of the mind. 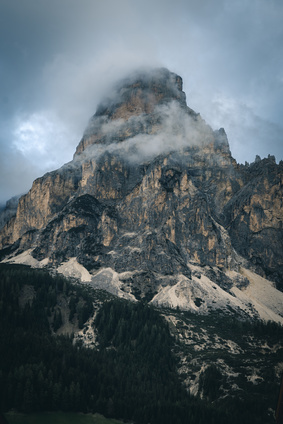 A mountain is a symbol of strength, stillness and presence. You benefit from all these things when practicing this posture. Tadasana balances the crown, 3rd eye, the heart and the navel chakras. The root chakra is also balanced as a connection to the Earth and the present moment is established. You will get the mental and physical benefits of working these chakras. As with any balance, if you are suffering from any disorder that can affect your balance, it is wise to practice the asana near a wall, chair or table for support. Pregnant women and menstruating women should stand with their feet hip distance apart. People with low blood pressure should be careful when standing still for extended periods of time.